Between the beers of Oktoberfest and the sticky mittens of Glühwein is the cloudy, light, young wine called Federweißer. The name translates to "feather white" and refers to the cloudy appearance of this early wine. Not that this is its only name. It is also called Neuer Susser, Junger Wein, Najer Woi, Bremser, Most or simply Neuer Wein (new wine). While the name depends on the region, you can count on finding it everywhere in Germany from September to the end of October. Here is everything you need to know about Germany's young fall wine, Federweisser. Usually made out of white grapes that ripen early like Bacchus, Ortega and Siegerrebe (which translates to "victory vine"). This fresh wine is sold just as it begins to ferment. This means it has high-sugar, yet low-alcohol. It can be sold as soon as reaches 4 percent alcohol, although it continues to ferment and can reach 11% before being consumed. The wine is made by adding yeast to grapes which allows it to ferment rapidly. It is then left unfiltered for consumption. The yeast makes the wine appear cloudy when agitated, one of its most identifiable features. It usually comes as a white, though it can be red and pink when red grapes are used and is then called Federroter, Roter Sauser, or Roter Rauscher. The wine tastes slightly sweet and almost sparkling like sekt. Don't let its sweeter reputation scare you away. The slight carbonation makes it more refreshing than traditional lieblich (sweet) wines. There are also versions where it becomes tart as it ferments. Besides, this is a drink to enjoy a glass or two, not down bottle after bottle. It is a beloved seasonal specialty like fresh apple cider in the United States, best enjoyed a glass at a time. 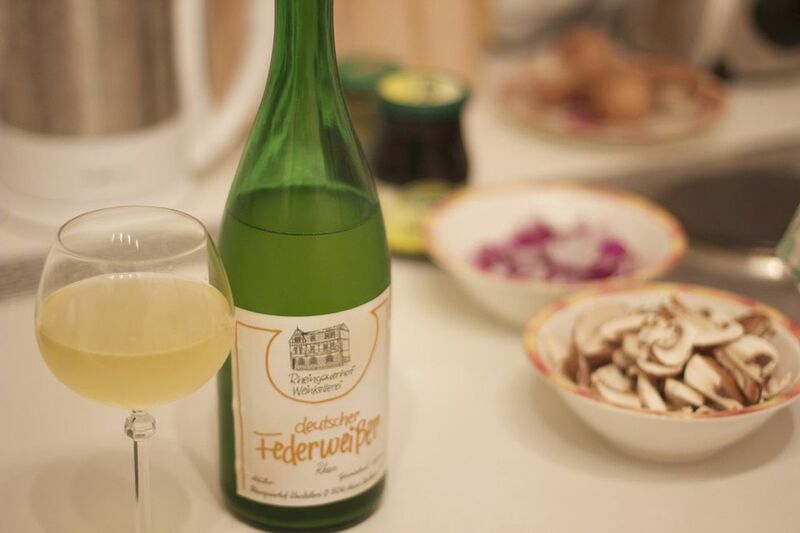 For many Germans, Federweisser is a fall essential. For just a few short weeks, it pops just about everywhere from roadside stands to supermarkets before it disappears... until next year. But this wasn't always the case. Because of the ongoing fermentation of Federweisser, it was once quite a challenge to transport bottles. Modern conveniences like improved transportation systems and refrigerated vehicles have allowed this fall wine to be enjoyed around the country and not just at the vineyards where it is made. Nevertheless, Federweiße is still best where yeast is put to grape. Opt for the bottle that traveled the shortest distance. Or even better, drink up at the small stands that open directly on the vineyard grounds. Sometimes it is elegantly bottled, while other times it is nothing fancy, simply swirling around in a two liter plastic jugs or reused wine bottles. The very best spots for Federweiße are in the wine-rich areas along the Mosel and Rhine rivers. There are small, local shops aplenty and even two festivals dedicated to this specialty wine: Deutsche Weinlesefest (German Wine Harvest Festival) in Neustadt and the Fest des Federweißen (Festival of the Federweiße) in Landau in der Pfalz. Whether you buy a bottle to take home from the store or a festival, take note that it should be consumed within a couple days of bottling. In that time, it continues to ferment and the high levels of carbonation mean there is a chance of explosion. Seriously. To prevent a wine disaster, most brands have a release for the gas. This ranges from a loosened cap to a hole punched into the screw top or a simple wrapping cap... meaning spillage is common for uninformed shoppers. Just take a look at the case of Federweisse and the trails of drips leading away from. To prevent a messy shopping trip, always carry and store Federweisse upright. If you want the bottle to continue to ferment, leave a fresh bottle unrefrigerated for a few days and listen to the gas escape and the wine mature. Like Federweisse, apples, conkers and mushrooms are all in season and must be sampled at least once for it to truly be herbst (fall). Dishes with these fall requirements appear frequently where the drink is served. In areas like Pfalz, Saumagen (sausage dish) is a must-have. But there is one essential pairing that cannot be missed. Zwiebelkuchen (onion cake) is the ideal savory treat to temper the sweetness of the wine and its rustic qualities mirror that of Federweisse. It usually resembles quiche (though it may also be served in rectangular hunks) with everyone having their favorite version. Generally it includes dough topped with sautéed onions, eggs and crème fraîche with Speck (bacon) — beware vegetarians! — mixed throughout.